There's good news for commuters using the park and ride facility at Castledawson Roundabout with the announcement of a £350,000 extension. The extension will add 192 spaces, including 10 disabled spaces, to the 78 spaces that currently exist. Infrastructure Minister, Chris Hazzard said the proposed scheme will provide additional capacity for safe and convenient parking for those wishing to share transport or take public transport. The car park will be served by a regular bus service operating along the main A6 between Belfast and the North West and this offers commuters an attractive alternative to using the private car for their onward journey. 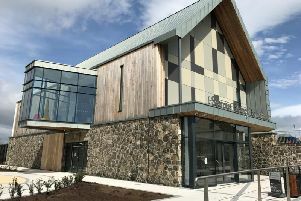 Mr Hazzard said: “The existing Park and Ride at Castledawson has proven very popular with occupancy rates at capacity in recent months. The increased popularity of Park and Ride and Park and Share represents a major and welcome shift in many people's travel behaviour. The work, valued at almost £350,000, is being undertaken by contractors FP McCann and is expected to be completed by April 2017.